Several years ago, when UNC-Chapel Hill professor Oliver Smithies won a Nobel Prize for his work in genetics, I was intrigued. As a business/finance person (and not a scientist), I was most astounded that Smithies worked in his lab regularly, despite being 82 at the time. More recently, UNC professor Aziz Sancar won a Nobel Prize for research in mapping DNA repair; he's younger, 69, but also continues to work. Naturally, as a UNC graduate, I am pleased that such notable research happens in my home state at my alma mater. Even more, I am glad that people, well at least two of them, are doing meaningful work at this stage of life. Judging from reports predicting disastrous retirements, I used to think that those who continue to work past the traditional retirement age of 65 must desperately need the money. Instead, I am learning that it's possible that they want to do interesting and valuable work. In some cases, they may enjoy both: doing important jobs and earning income. Many companies hire part-time workers for jobs that may be especially attractive to retirees. They might allow for flexible hours, require a limited number of hours weekly, or involve difficult but rewarding work. In Choose Your Retirement: Find the Right Path to Your New Adventure, author Emily Guy Birken mentions several employers that hire retirees as part-time employees and offer benefits such as health care insurance and 401(k) plans. These are mainly customer service positions at large chains such as Starbucks, Costco, REI, and Lowe's. It's possible that my husband and I might start a business after we retire or launch one in anticipation of retirement. Many people run a business that syncs heavily with their professional background or personal expertise. However, some folks get training in a new field and apply that knowledge to running a business. According to Inc. magazine, the types of businesses most commonly started by retirees are consulting firms, online businesses including blogging, bed-and-breakfast inns, and senior care agencies. Very often, husband-and-wife teams run a business as a way to generate income and spend time together in retirement. There's a fine line between running a business and generating side income. I think of side income as revenue you generate sporadically or on a project-by-project basis whereas a business generally requires being available on a regular basis. Ideally, I could find a way to generate income by developing one of my talents or pursuing an interest. From what I've seen, those who do well tend to know their markets and how to serve them, and genuinely enjoy combining a money-making idea with a personal passion. A popular way to make money in retirement is owning and/or managing rental properties. Some folks I know have retired early or stepped away from traditional jobs well before 65 years by building a real estate portfolio. They started to accumulate rental properties while working at full-time positions in their 20s, 30s, and 40s. They learned the ins and outs of locating properties, finding and screening tenants, maintaining properties, collecting rent, etc. before retirement. As a result, they've been able to avoid or deal with rental issues, like finding reliable contractors or locating good tenants, more effectively in retirement. More recently, I've seen people generate income through vacation rentals using online services such as AirBnb or VRBO. One technique here is to purchase a primary residence with the intention of creating and renting a separate apartment attached to the home or on the same land. In this way, they can generate income and manage the property more readily. Others I know have learned to buy and sell properties quickly for a profit. The process of “flipping” seems challenging to me but could be enriching for people who know how to spot a bargain and handle fix-ups themselves. 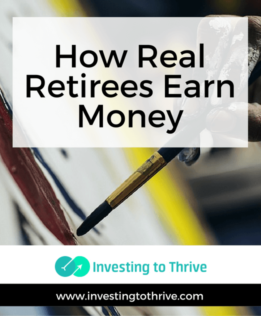 If you're interested in this method of making money in retirement, this article seems like a great place to start to educate yourself on the process. As for me, I'm intrigued by the idea of owning rental properties, especially ones in vacation areas or cities with high demand for short-term rentals so I could possibly become an AirBnb host. I'll be investing time in researching this possibility and gaining some handyman/woman skills to control costs of property maintenance. Many people continue to work on a full-time basis past retirement age. Some remain in their jobs because they enjoy working. Others are retired from one career and pursuing a completely new field. For example, I know people who earned bachelors' and master's degrees in disciplines such as counseling, divinity, and education in their 50s and 60s. They now work in full-time positions or similar ones in these fields, after decades of working in entirely different industries. Though you don't often hear of people getting late-in-life degrees, many people pursue education in order to satisfy a personal desire and then use this education in a new career. Hopefully, I'll generate plenty of unearned income from investment sales, dividends, and interest. I may enjoy a care-free retirement that involves no work of any kind. However, it's more likely that I'll find some form or work that I truly love, which also gives me a sense of accomplishment and allows me to be involved in the community. I may want to continue working to stay financially stable. But, hopefully, I'll be inspired to do work that I find meaningful. Disclosure: I am long on Starbucks, Lowe's, and Costco.